. 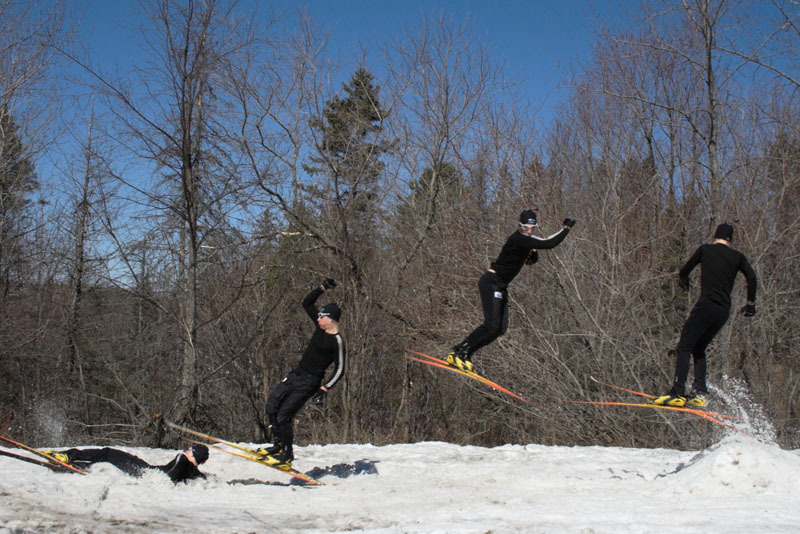 : Athlete Diary: Post training stress disorder :: Ski XCOttawa.ca :: Skiing in Ottawa and Gatineau Park :. Trying to come up with an interesting athlete diary entry is quite challenging, I'd probably say that I dread it more than a 5 x 5 minute Penguin interval.... but both have to be done! I have tried to come up with a creative insight into my life by trying to explain PTSD. --> not post-traumatic stress disorder but post-training stress disorder. Stress is something that everyone has to deal with and for the most part, very little in life stresses me out. This might be because of the amount of athletic activity I take part in (the amount of endorphins I pump through my body), or it might just be a hereditary characteristic that I have been lucky enough to inherit. Either way, I feel I am fortunate to be a fairly "mellow" person although sometimes this turns out to get me in trouble. During the ski season, I was able to keep all my apprehensiveness at bay although I did find myself uncharacteristically worked up at times. After nationals, PTSD hit hard and stress came at me from all angles. I had to try and combat each problem without bogging myself down too much. Figuring out possible plans for next year, realizing that my thesis poster/ defense was due in a week, figuring out summer plans, applying for jobs/graduate programs, studying for exams, celebrating the end of the season with friends (i.e. time management) were all things which I had to combat. I am half way through by now and can finally see the light at the end of the tunnel... which for me will be once I hand in the final draft of my thesis and write my last exam of my Carleton University career. April 23rd; 1 week, 3 days, 16 hours and 24 minutes. I had been back from Nationals 3 days, and I had just started to realize the great number of things that I had ahead of me that required attention. 5 out of the next 7 days I had social engagements and that evening was the Athletics Banquet, always a great evening with the ski teamï¿½! In the morning of the banquet, just before I left for class, I received a call from Jennifer Brenning (the athletics director) who told me that I would be receiving one of the big awards and I would have to say a few words. On one hand, I was extremely excited and honored, and on the other hand, I was wary and nervous. For those of you who do not know me too well I might say that I can be quite shy in situations that I do not feel totally comfortable in. I prefer the attention to be focused elsewhere rather than on me. Public speaking is one of my most feared endeavors, and the last time that I had to do it was 4 years ago when I was valedictorian at my high school. A speech in front of 2000 people, you'd think that would cure my fear but unfortunately I'd say that it did nothing of the sort. Now this was small potatoes compared to that but I still spent most of the day and pre-banquet party thinking through possible things to say which could be a little different from the usual acceptance speeches. That day was quite busy as I had class all morning, then there was a pep rally for Carleton's two national championship teams over lunch and in the afternoon I had to get a dress shirt for the evening. Therefore, I had about 30 minutes to quickly write something up on the computer, shower and get dressed before the pre-banquet preparation/ party. This lack of time contributed to an interesting turn of events. The banquet was a grande affairï¿½ Ed McCarthy was holding his own and doing a great job as MC. It was difficult to thoroughly enjoy myself as my mind kept coming back to the inevitable 'here is Gavin Hamilton to say a few words'. Finally, it came time for the big awards and I was called up with fellow recipient of Male Athlete of the Year, Osvaldo Jeanty from the basketball team. I accepted my award first, I felt as nervous as Landis was when he was taking a doping test post Tour de France. With my legs and hands shaking, I was able to stutter out a ...thank you and ...very honoured... and some other things that I can hardly recall. Then it came time for my prepared notes. I had written a list of my top ten Unforgettable University Athletic Experiences in my four years here, something not unlike Jay Leno's Top Ten lists on the Late Show. 10. Roller Skiing in freezing rain on cold, dark November Mornings. 9. Each and every Athletic's Banquet- celebrating the year's accomplishments. 8. Our coaches, John Langstone and Don Moxley, and their daily team e-mails. 6. Volunteering for the Carleton Alumni Golf Tournament Fund Raiser that raised over $140 000. 5. The lovely Athletic Therapy Centre - Maybe next year they might be able to beat the Nordic Ski team in curling. 7. Post Nationals Celebrations- Prince George stands out on this one, fellow teammate Erika Langman would agree with me on this one. 4. 3 hour Mooney's Bay workouts capped off with a strength circuit serenaded by Langstone's 60's music. 3. Always being overshadowed by the Basketball team! Just kidding. 2. The thrill of competition and the feeling you get putting the stylish Carleton spandex suit the morning of a big race. 1. The life long friendships that I have made in being apart of athletic community here at Carleton. My list started very well, and I think that for the most part it was quite well received. It all fell apart once I got to point #7, or #6 as you see above. I made the list on the computer and after typing some of my university experiences, realized that I would probably want to switch the order of a few of them. Unbeknownst to me, I also forgot to change the numbers beside each point. Luckily, the rowdy and quite inebriated men's rugby team kept me in order by yelling out my mistake... I had thought that I had just said the number wrong, I didn't realize that this error propagated throughout the entire document I had in front of me! After a couple more mistakes, and mentioning that I had a Math Minor in my degree, I was able to get through the list. The point I made about the Basketball Team definitely got the most laughs and in my interview with the A CHANNEL afterwards, the reporter even asked me a question about this. Although the speech didn't go exactly as I had planned, I am definitely glad that I had something prepared because I know that it turned out much better than it would have without a jumbled up list in front of me. Iï¿½m sure that most of you are wondering what the 'eye opening' theme of this story is. For me it is the differential amounts of recognition that people get. I feel like I did not do anything out of the ordinary this year, I even felt that I may have worked harder last year or the year before, but fortunately I was able to come up with a few fast races this year. I do not think that it is important to place that much importance on the results of our accomplishments, it is the day to day activities that we should be proud of. The media is guilty of accentuating this and although it is good to have goals to strive for, I do not believe that the achievement of them define the person (although it is nice when it happens!). Aside- I just realized that I said at the start of the article that I donï¿½t get very stressed outï¿½ I think I disproved that with public speaking. Iï¿½ll rephrase that and say, I do not get stressed out unless I have to do a speech in front of peopleï¿½! I would also like to end with saying that probably my most treasured accomplishment of the season (which beat out all awards and medals earned) came unexpectedly at the LaFleur bbqï¿½ Check out this video and you will see what I mean. If this video doesn't play continuously, hit REFRESH to view it again or click here to open it in a new window.